Mark G. Carrier is the senior officer of the B. F. Saul Company Hospitality Group. The B. F. Saul Company is a privately held diversified real estate and banking concern based in the Washington DC area. The Hospitality Group owns and operates a portfolio of 20 business class hotels, which are affiliated with Intercontinental Hotels Group, Marriott and Hilton and The Hay-Adams one of the nation’s finest hotels. The Hospitality Group generates $165 million in revenue and employs 1,450 team members in the operation and management effort. Carrier’s leadership responsibilities for the B. F. Saul Company Hospitality Group include strategic direction, overall operational leadership, acquisition and development of properties, long term financial and capital planning along with the development and implementation of corporate policies, procedures and management systems. He represents the company in relation to lenders, franchisors, clients, governmental agencies and industry associations. 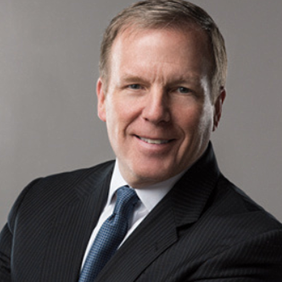 Carrier serves as Chairman of the American Hotel and Lodging Association. He served on the Strategic Planning Committee and Funding Group as well as the Search Committee that help guide the renewal of the association. He is the direct liaison to the Consumer Innovation Forum. Carrier is a past Chairman of the IHG Owners Association, the global franchise owners association of Intercontinental Hotels Group. He serves on Marriott’s Distribution Advisory Committee, Emerging Technology Advisory Group as well as the SpringHill Suites Marketing Council. He also serves on the Distribution Advisory Group for Hilton. Carrier is the Immediate Past Chairman of the Tyson’s Partnership. This organization represents the interests of the diverse stakeholders in Tysons Corner in the focused effort to turn the area into America’s Next Great City. Serving on Fairfax County’s Economic Advisory Council he provides representation of hospitality interests to that body. He is also a Board member of the Northern Virginia Chamber of Commerce and a member of the Economic Club of Washington. Carrier is the Chairman Emeritus of Visit Fairfax, the county’s tourism promotion organization. Carrier joined the board of FXVA as an inaugural member and served in the Chair capacity for two terms. Carrier is a member of the Cornell Hotel Society as well as the Cornell Real Estate Council. In 2013, Carrier accepted the Kemmons Wilson Service Award from the IHG Owners Association in recognition of contributions to the industry and fellow owners. He was also named Virginia Hotelier of the Year by the Virginia Hotel and Travel Association. Carrier joined the B. F. Saul Company following graduation from the Cornell University School of Hotel Administration. He progressed to his current senior position following a career of growing responsibility with the organization which included on-site management, regional responsibilities as well as development and acquisition of hotels. He is a 38 year resident of Fairfax County, Virginia and currently makes his home in Reston with his wife Cheryl.